On April 6, 2011, about three years before the City of Vancouver formally acknowledged that Vancouver is on unceded Coast Salish territory, the City declared its 125th birthday, celebrating with a series of free events and public art works. One public art project the City commissioned was Digital Natives, a text-based, site-specific installation considering Indigeneity in the early 21st century of globalised digital communication technologies and media saturation. Curated by poet Clint Burnham and artist Lorna Brown for Other Sights for Artists’ Projects, the installation took the form of a series of tweet-like texts broadcast on Astral Media’s large electric billboard, located on Sen’akw, Squamish Nation territory, just to the side of the Burrard Street Bridge. 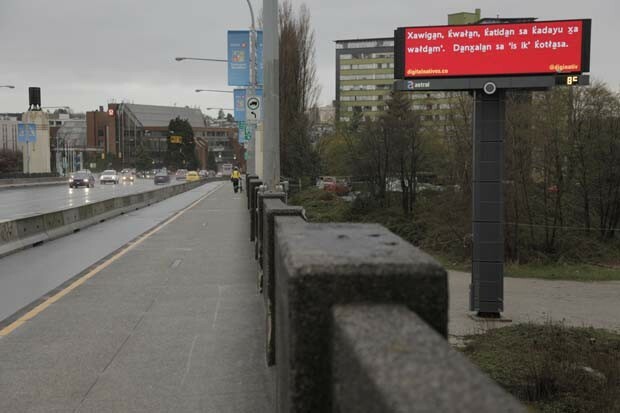 From April 4 –30, pedestrians, cyclists, and drivers encountered typical billboard content, advertisements, interspersed with unattributed texts by several Indigenous and non-Indigenous North American artists and writers, including several Vancouver poets. City of New Westminster is one of several cities and municipalities comprising the Greater Vancouver Regional District (GVRD), also called Metro Vancouver. 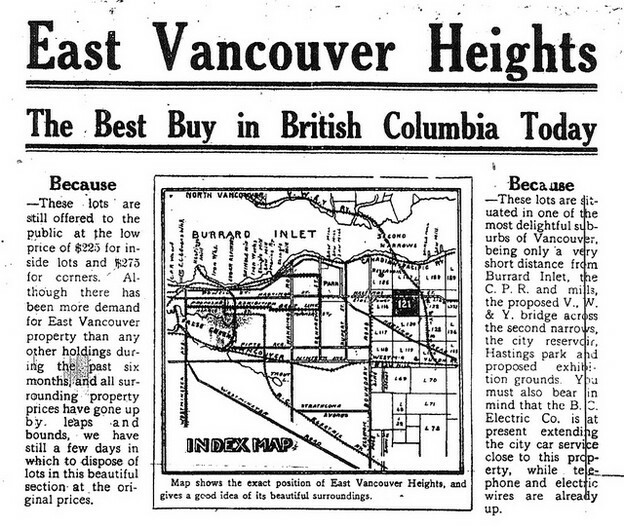 Named by Queen Victoria in 1859 after her favourite part of London and hence nicknamed the Royal City, New Westminster was the first Canadian city West of the Great Lakes. 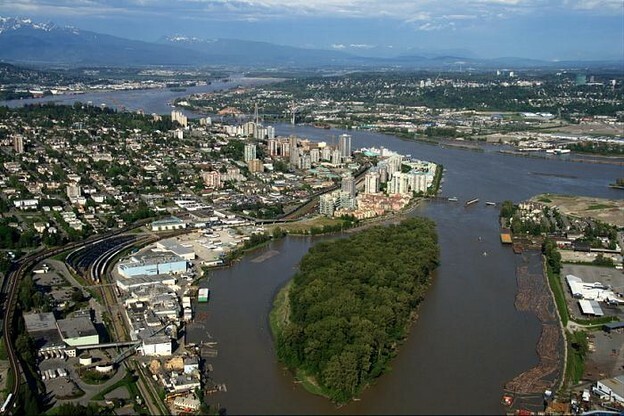 The image above shows Poplar Island situated in the Fraser River, with New Westminster built on the West (left) bank of the river. Poet and activist Cecily Nicholson's second book of poetry, From the Poplars (Talonbooks, 2014), documents the history of this small depopulated island as traditional Qayqayt land, a former reserve, a smallpox quarantine zone, a ship-building site during the First World War, a base for the logging industry, now unused and lush with trees, in the present moment of the city’s waterfront redevelopment to expand retail and residential space. The image above is from The Place of Scraps, courtesy of the author. I begin my consideration of Vancouver poetry and poetics with First Nations poet, Jordan Abel’s Dorothy Livesay Award-winning The Place of Scraps (Talonbooks, 2013). The source material for the book is anthropologist Marius Barbeau’s Totem Poles, an early 20th century two-volume text on Pacific Northwest totems. Totem poles tell the history of a people. Like its source, Scraps deploys linguistic and visual systems of representation to record First Nations history but unlike its source, it reveals anthropology as a colonial weapon in its creative distillation of Barbeau’s ethnography. 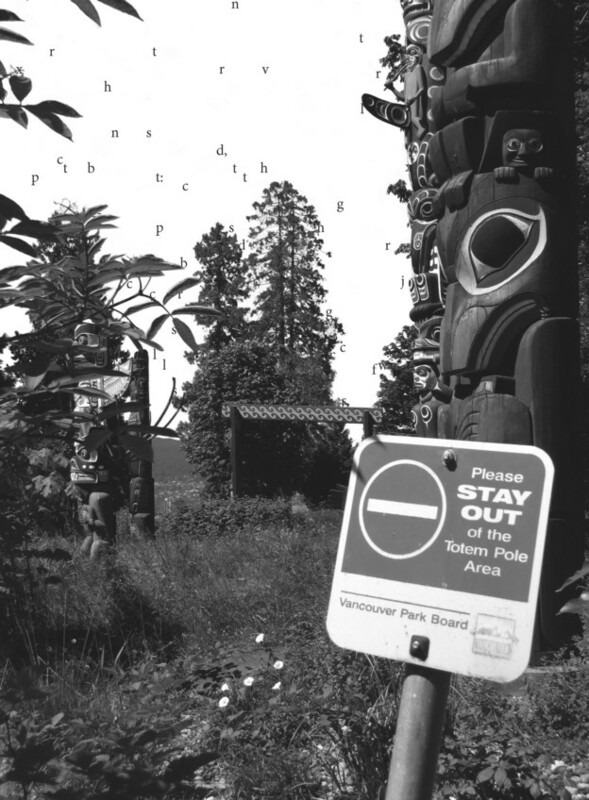 Images of First Nations peoples and their cultures are layered on dense lines of text; sometimes, as Vancouver poet, educator, and activist, Rita Wong describes, “English litters the sky, its typed letters eventually demolishing into illegible insects that flit above archival photo-testimony to land/people.” Passages of Barbeau’s Totem Poles are erased and interspersed with dated prose sections cataloging Abel's loss and recovery of personal history, resulting in a totem pole of the poet’s history within a history of his ancestral people, the Nisga’a Nation.